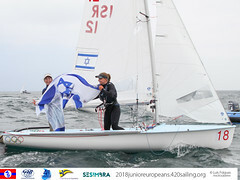 The 2012 470 Junior World Championship came to a close today, with the new World Champions, Simon Sivitz Kosuta/Jas Farneti of Italy in the 470 men/mixed event and Afrodite Kyranakou /Jeske Kisters of the Netherlands in the 470 women having dominated their respective fleets from start to finish of the 11 race series. Afrodite Kyranakou /Jeske Kisters of Netherlands held onto their top position and became the Women's Junior World Champions with a small margin over the defending champion Annika Bochmann /Elisabeth Panuschka of Germany. In the Men/Mixed fleet the Italian crew Simon Sivitz Kosuta/Jas Farneti cemented their dominance of the regatta with a second placing behind New Zealand's Gareth Moore/Ben Goodwin. The 2012 470 World Championship was hosted by the Takapuna Boating Club and sailed on the Waitemata Harbour in New Zealand. 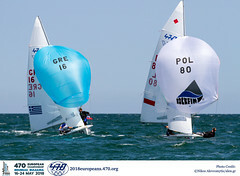 Sivitz Kosuta/Farneti went into the medal race, having already won the World Championship title. They just wanted to have a good race, "we have no pressure on us, we will just race our own race, but we know the real competition is between the second and third position," they said. When asked how they'd found the regatta the Italian juniors responded enthusiastically, "Very good, we love it here and we were here four years ago at the 420 World Championship sailing together. So, we know some of the conditions." "In the last three months we've trained a lot in Cagliari (Sardinia) with the Italian Olympic representatives, and we also sailed at the 470 Worlds in Perth just before this. We placed 36th and used it as training for this Championship." In second place overall was New Zealand's James Turner/Finn Drummond who got together specifically for this regatta, and trained together for three weeks. "Our expectations were to do well, but after the Pre-Worlds we had work to do!" When asked what he attributed their good results to, Turner said, "we were more consistent that our rivals, all of our placings were good enough to keep." Of the Italian winners’ clear dominance of the regatta, Turner responded "they had a significant edge on everyone in every condition, they were also consistent rather than taking risks." Following this Champiosnip, Turner will partner back with his permanent crew, while Finn is looking at a multihull sailing path. In third place were the French crew Sacha Pelisson/Nicholas Rossi who were more consistent than the Netherlands and top Australian crews who had also been in the running for a bronze medal placing. With ten women's crews competing in the world championship, qualification was never an issue however for Kyranakou/Kisters the goal was to keep a good distance between their next rivals from Germany, Great Britain and Japan to secure their gold medal. The recently formed team also wanted to sail a good race and have fun, "it's going to be windy, and we like that" they commented at the end of (attempted) racing on Thursday. "We didn't know what the level of the fleet would be, or what the weather was like before the regatta but we are happy with how we are going. We started sailing in July 2011. We did the Youth Worlds in Medemblik after only two days of training, but now we are a team - this is what we focused on in our training up to this event," the pair concluded. "It was worth coming to New Zealand for the variety of conditions, now we are going back to university and exams. We will evaluate our performance, our weaknesses and strengths." This was the final junior year for Kyranakou and the Netherlands team are pleased to get all the experience they could within this fleet before competing in the senior 2012 470 World Championship in Barcelona, Spain in May 2012. Annika Bochmann/Elisabeth Panuschka won the medal race, but this wasn't enough to close up the points difference between themselves and the leaders, but did give them a six point margin over bronze medallists Anna Burnet/Flora Stewart of Great Britain who placed second in the medal race. 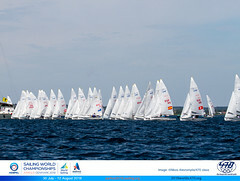 The 2012 470 Junior World Championship is now over, but the boat park was a hive of activity as many sailors prepared to take part in Sail Auckland which begins tomorrow at the Royal Akarana Yacht Club.